Easter Weekend will soon be upon us and so I wanted to make some cute seasonal decorations for our home. A friend of mine made an Easter Tree, I was so in awe of hers I decided to make one of our very own. Rosalie and I set to work and came up with this pretty pastel Easter Tree. 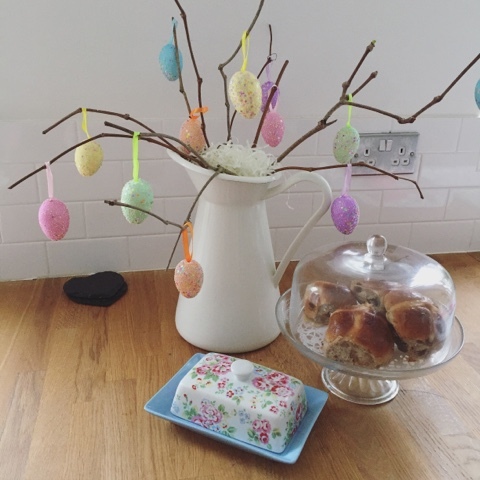 It’s so easy to make but looks lovely adorned with decorative eggs. It’s a brilliant activity to do with the kids over the holidays. – Decorative Eggs, we used 12. 1. Firstly gather some twigs or sticks. I just cut off 12 branches, of similar size from a bush in my garden. 2. Take your jug and place half of your tissue paper into the bottom of your jug, this will help keep your twigs in position. 3. Next, arrange all of your twigs in a way that looks nice, once you are happy with their position you can put the rest of the tissue paper on top of the twigs to stop them moving about. 4. Next, it is time to hang your decorative eggs, Rosalie and I did this together. You could make your own egg decorations but that is a lot of hassle and I preferred the look of these sparkly eggs that I found in the pound shop. And that’s really all there is to it! You can watch my Easter Tree Decoration tutorial over on my Youtube channel. I hope you like it. If you make your own Easter tree I’d love see, please tag me in any pictures. My twitter handle is @rosey_home and you can find me on instagram @roseyhome. This looks so pretty! I love the pastel shades that you've used on the tree too. Ah it looks fab! So simple and sits beautifully in your home!! Aw this looks fab and easy to put together. Something I need to make. My sister-in-law has done something similar this year.